Editor’s note: Have you seen the new Lucky Puppy print magazine in stores? Or in the waiting room of your vet’s office? This article appeared in our Fall issue. Subscribe to Dogster and Lucky Puppy and get the magazines delivered to your home. In a yoga class, muscles strengthen. Stress disappears. Students achieve a state of mindfulness. In a doga class (dogs + yoga), all of that happens and more, with people and pets deepening their bond. Photo by Gina Cioli/Lumina Media. Amanda teaches doga with help from her Miniature Poodle, Claire. They begin with a seated meditation, during which Amanda breathes deeply and chats, petting and sending calming energy to Claire as the class follows their example. “Our dogs will look at us, smiling and panting, and some will even howl before settling down,” she said with a laugh. They then move on to traditional yoga poses, with Amanda walking around the room to introduce doga modifications. For example, she will place a smaller pup on his human’s lifted hips and stomach during Bridge. The human builds strength, thanks to the added weight, as does the dog who must stay balanced. With larger pups, Amanda places only their paws and partial weight. No matter a dog’s size, they can instead use Bridge pose and others for playtime with their human. YogaOne doga classes, which are held at nearby pet-supply store Natural Pawz to keep allergens out of the studio, also include doggie massage to deepen connection and further calm the pups. In fact, Amanda recalled one rescue dog in particular who relaxed so much she overcame her usual shyness around new animals and people. 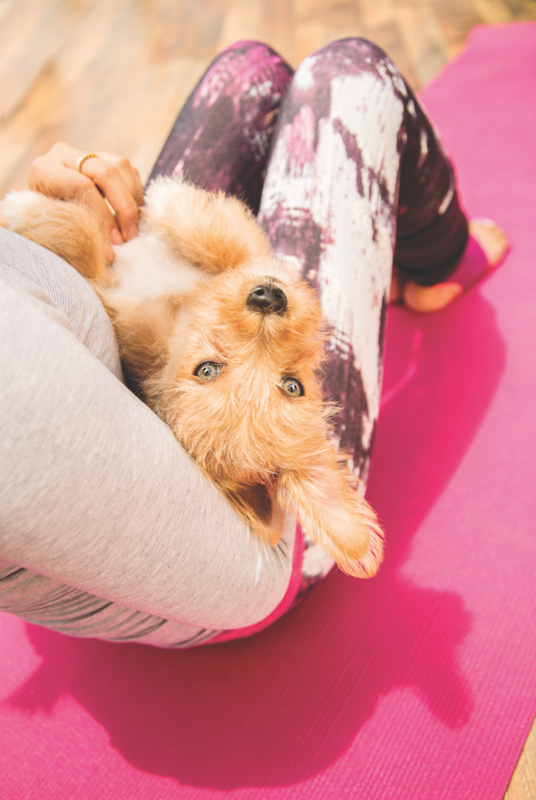 Yoga studios across the country offer doga classes, but if you can’t find one nearby or prefer to practice at home, here are two poses to get you started. This resting pose works for dogs of all sizes. These instructions are for small pups; see the modification at the end for bigger dogs. Kneel at the back of your mat with your big toes touching. Sit on your heels, and then spread your knees to create a space wide enough for your pup. Invite your dog into the space — he can either curl up or lie down facing away from you. Fold over your dog, placing your hands palms down in front. Breathe deeply — and don’t be surprised if your pup falls asleep. Modification: If your dog is too big to fit between your knees, or just doesn’t like being underneath you, invite him to lie on your back instead; a partner can help with the placement. The additional weight will help further open your hips. This more challenging pose also works with dogs of all sizes. Again, these instructions are for small pups, with a modification at the end for bigger dogs. Stand lengthwise on your mat with 4 to 5 feet between your feet. Turn your left foot inward 45 degrees and your right foot outward 90 degrees; face your hips and shoulders in the same direction as your right foot. Bend your right leg until your knee is directly over your ankle. Draw your torso back slightly and relax your shoulders. Pick up your dog, returning to the previous position, and lift him over your head. Modification: If your dog is too heavy to lift, or if he just doesn’t want to be lifted, invite him to place his paws on your bent right leg to challenge your strength and balance, as well as your dog’s. The post Love Dogs? And Yoga? Incorporate Your Pup Into Your Practice appeared first on Dogster.